I'm all thumbs up for unconventional and modern furniture, especially if they are eco friendly, and that just because I'm against forest grubbing. But if you think otherwise, take into consideration the fact that it doesn't have to be necessarily woody to create an environmental effect. Modern furniture designers test their ingenuity by creating twisted furniture pieces, literally. 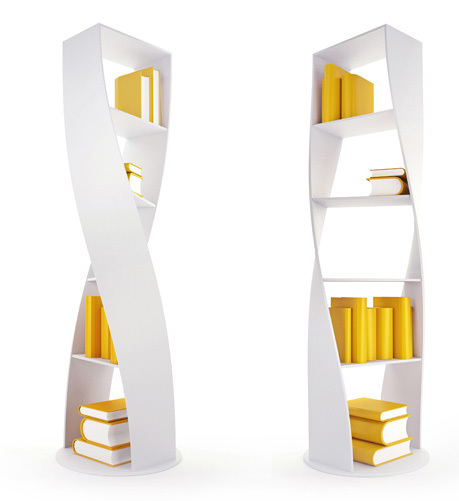 Take for example this MYDNA twisted bookcase from Joel Escalona's furniture studio. It's unique, fluid in shape and intriguing as a furniture piece. Adjust it in a corner somewhere and it will highline and bring the room's elements together through its shape, mat colors and unconventional material. If you can challenge gravity with the MYDNA twisted bookcase, than book me up for Joel's next collection of twisted furniture pieces.